Heavenly music that celebrates the joy of life. Elation, love and inner bliss. This sublime music evolves slowly and gently - mysterious ethereal soundscapes gradually blooming into choral crescendos that border on climactic...before receding into soft, celestial passages that envelop the mind and open the heart. 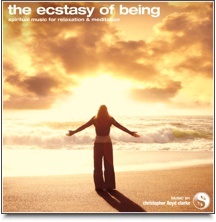 The Ecstasy of Being is a musical work of great emotional depth – a composition that reaches the heights of elation whilst remaining utterly peaceful. This music contains no bells or pianos or percussive instrument - it's free from any sounds that might jolt you out of a state of deep relaxation.